Half of Mumbai’s residents are slum dwellers. Constantly being evicted by the authorities, what if they were to occupy railway tracks - as Rajasthan's Gujjars did - to ask for their right to housing? Would they be allowed to do so for even an hour? Who gets to block trains and who doesn’t? Some block them for hours, others for weeks. Some get lathi-charged, others have hordes of policemen just standing by. Can all of them achieve what the Gujjars just did? It took 10 days for the Gujjars of Rajasthan to end their rail blockade. They got the assurance they wanted: two new laws guaranteeing them a total of 19 % reservation. Gujjars make up 7 % of Rajasthan’s population. In these 10 days, 326 trains were cancelled or diverted, and people across the country had to cancel their summer travel plans. Under the Railways Act 1989, disrupting railways is a crime punishable with a two-year sentence and/or a fine of Rs 2000. Not one Gujjar who blocked the tracks was arrested. It was left to the Rajasthan High Court to order the government to take action – but by then, luckily for the government, the agitation was over. Gujjar leader Kirori Singh Bainsla, a former colonel in the army, apologised for the inconvenience. In distant Mumbai, blocking trains brings forth two contrasting images: police firing on the one hand; and on the other, rowdies waving their arms triumphantly in front of a stalled local train. In 1985, police fired on residents of Bhayandar, then a fast-developing suburb, killing 11. The protestors, white collar workers and small businessmen, had held up the Delhi-Mumbai Rajdhani to highlight the lack of trains to Bhayandar, after a hunger strike had failed to get the authorities’ attention. They were unorganised and peaceful; but there was no way anyone could get away with holding up a prestigious train like the Rajdhani. Street protests were then commonplace in Mumbai. But that one incident imprinted into the minds of Mumbaikars that it was beyond the pale to block rail tracks. Gradually however, as Bal Thackeray’s Shiv Sena grew in strength after the 1984 riots, Mumbaikars began getting used to jumping off trains halted midway between stations by Shiv Sainiks during their frequent bandhs. Everyone knew the latter wouldn’t be touched. But these rail rokos lasted a few hours at the most; even Shiv Sainiks, knowing that Mumbaikars depended on local trains, avoided jamming the tracks during peak hours. It’s difficult, therefore, to understand how Gujjars and Jats can block long-distance trains for days on end. Even the courts have wondered how such disruption has been allowed, summoning chiefs of police to report on action taken. But the majesty of the courts has crumbled before the clout of the Gujjars and the Jats. The just-concluded agitation is the fifth time Gujjars have invaded the tracks. They started their agitation for reservation in 2006 by uprooting tracks at Hindaun railway station. Hindaun, on the Mumbai-Delhi track, is Bainsla’s hometown. Over the next two years, in agitations lasting from a week to 25 days, they had not just blocked rail tracks, but also burnt a railway station, lynched a policeman, and almost set on fire a goods train carrying fuel. 72 Gujjars died in these agitations, but undeterred, in December 2010-January 2011, they occupied the railway tracks for 23 days, forcing Rajasthan’s hotels to cancel their New Year celebrations. That time time, the Congress was in power and no Gujjar died. In 2009, Bainsla had fought the Lok Sabha elections on a BJP ticket and lost. Since the BJP first promised them Scheduled Tribe status in the run up to the 2003 Rajasthan Assembly polls, it is but fitting that the party has finally yielded to the Gujjars’ strong arm tactics. Yet, it seems strange that the party’s ‘Iron Man’ and ‘Vikas Purush’ Prime Minister has allowed the Gujjars free rein, causing a loss of Rs 100 crore to the railways. Perhaps that’s why Modi’s government rushed to file a review petition against the March judgment of the Supreme Court that struck down reservation to Jats as OBCs. The UPA had granted this as an election sop last year; it’s the NDA that’s defending the decision today. It knows the political consequences of ignoring Jat fury. 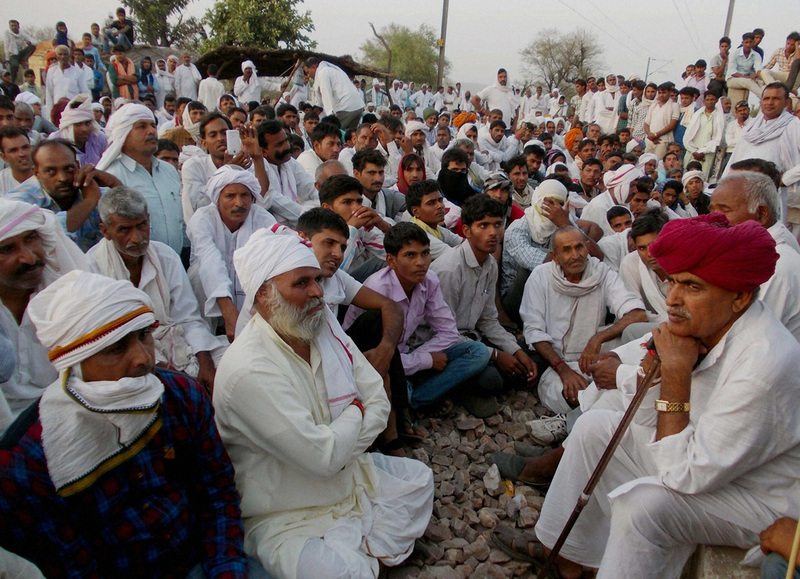 In 2011 and 2012, the Jats of Haryana blocked railway lines for two to three weeks, asking for reservation as OBCs. They even landed up in the capital threatening an agitation. One Jat died in police firing. This time too, they had threatened to cut the power and water supply to Delhi if the Supreme Court decision wasn’t nullified, a la Shah Bano. More than the Gujjars, it’s the Jats who remind one of the Shiv Sena. When 98 of them were arrested for burning alive two Dalits and setting 18 Dalit homes on fire in Haryana’s Mirchpur in 2010, they blocked railway tracks for 11 days. Leaders from the BJP and the Indian National Lok Dal visited them to show solidarity as they feasted on wholesome meals provided by sympathetic villagers. In September 2011, 15 of them were convicted. Rail rokos have become commonplace over the last 15 years; all parties and aggrieved groups resort to them for a day or two. The police make mechanical arrests; yet, sometimes, they have wielded their lathis, used tear gas and even fired in the air on protestors not half as violent as the Gujjars and Jats. Bhopal’s gas survivors were injured in 2012 during a rail roko; so were those agitating for a separate Telangana in 2011. But there are two sets of people who enjoy Gujjar-Jat-like immunity. Militant groups in the North East manage to disrupt rail traffic for weeks on end. But that region remains uncovered by the media, so no one outside gets to know. The other group which uprooted rail tracks in full view of TV cameras was the BJP-led Amarnath Yatra Sangharsh Samiti, which managed, despite a Congress-led Centre and an overwhelming Army presence in Kashmir, to impose an economic blockade of the Kashmir Valley in 2008 for over six weeks. So what counts – political clout or numbers? Fifty-four per cent of Mumbai’s citizens are slum dwellers. Constantly being evicted by the authorities, what if they were to occupy railway tracks to ask for their right to housing? Would they be allowed to do so for more than an hour? Medha Patkar was dragged by her hair by the police simply for leading a morcha of evicted slum dwellers to the Mumbai Municipal Corporation in 2005. Muslims form 10.6 % of Maharashtra’s population. The Bombay High Court upheld 5 % reservation for them in education last year, striking down similar reservation for them in jobs. The BJP-Shiv Sena government saw to it that even this court-approved reservation in education could not come about. Should Maharashtra’s Muslims take a leaf out of the successful Gujjar and Jat protests and block trains to get the court-sanctioned reservation? Will the BJP government show them the leniency they have shown the Jats and Gujjars? Will the Shiv Sena, master at such agitations, let Muslims follow their lead?